Mount Alvernia is a Catholic college and has, as its primary reason for existence, education in the spiritual and religious facets of the lives of our students. The education of our students in religious and spiritual areas draws deeply on the Catholic Christian tradition, and is inspired by Franciscan spiritual traditions. We strive to help meet the spiritual needs of our students, to provide them with positive experiences of the Catholic Christian tradition, and to foster their critical and authentic participation in contemporary culture. The faith traditions of students who are not Catholic and choose to attend Mount Alvernia College are respected and add a richness to our community. The examination of other faith traditions is seen as important to the holistic education of our young women. Our model of Religious Education involves the distinct and complementary nature of both religion curriculum and the religious life of the College. Religious Education is compulsory at all year levels, and uses the Religious Education Archdiocese of Brisbane Curriculum, P-12, as approved by Archbishop Coleridge in 2013. The Religion Curriculum P-12 enables students in Years 7 to 10 to learn about various ways in which humans understand and express the mystery of God or ‘the Other’, including insights from the major world religions. In the Francis School (Years 7 & 8), Religious Education is taught as part of Integrated Studies. 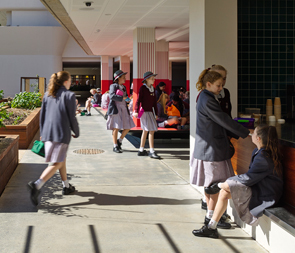 In the Clare School (Years 9 & 10), it is a school-based subject and, in the Elizabeth Hayes School (Years 11 & 12), a range of choices from specialised sources is provided to meet students’ needs and interests – Religion and Ethics and Study of Religion (Queensland Curriculum and Assessment Authority) and Certificate III in Christian Ministry and Theology. We seek to develop the religious literacy of students, with religious knowledge and skills being formally assessed. No attempt is ever made to assess the faith or belief of students. Religious Identity and Culture: Mount Alvernia College is called to be a real and living expression of the Church’s pastoral mission in the world. Our beliefs, values and practices, quality relationships, the aesthetic, social and physical environment, and its organisational structures and procedures are expressions shaped and developed by our Catholic Christian tradition in the Franciscan way. Evangelisation and Faith Formation: As individuals and as a community, Mount Alvernia College expresses in a simple and direct way that who we are and what we do is because of our relationship with Jesus Christ, Saint Francis and Saint Clare of Assisi, and Elizabeth Hayes, foundress of the MFIC Sisters. Prayer and Worship: Experiential aspects include whole College Masses and liturgies, class Masses and liturgies, reflection and retreat days, class prayer and other prayer rituals, and celebrations of special feasts. Social Action and Justice: Social action, education and community awareness involves many activities undertaken by the community, and are often led by the Outreach and Liturgy Committees. We give particular support to Franciscan and other Catholic community organisations, such as Catholic Mission, Caritas and St Vincent de Paul, together with a multitude of awareness-raising activities. In the College, we hope to foster a climate of respect for every person, of reverence for God and all of creation, of affirmation and drawing forth giftedness, and of the challenge to become better people who demonstrate forgiveness and justice.